Goodreads Summary: St. Petersburg, Russia, 1888. As she attends a whirl of glittering balls, royal debutante Katerina Alexandrovna, Duchess of Oldenburg, tries to hide a dark secret: she can raise the dead. No one knows. Not her family. Not the girls at her finishing school. Not the tsar or anyone in her aristocratic circle. Katerina considers her talent a curse, not a gift. But when she uses her special skill to protect a member of the Imperial Family, she finds herself caught in a web of intrigue. This was one of my highly-anticipated debuts for 2012, and thank goodness I didn't have to wait long into the year to read it! With an exotic Russian setting, an intriguing world of paranormal creatures in the royal court, and a boy worth swooning over, Robin Bridges created a fantastic debut novel and one that kept me up reading into the wee hours of the morning. I think my love for books with foreign settings has been pretty well established, and the setting of The Gathering Storm is no exception. I enjoyed traveling back in time with Katerina to the late 1800s and being part of the Russian nobility, attending balls and witnessing an era when chivalry was very much alive. The addition of the paranormal elements to this world was nothing short of ingenious. There were a variety of paranormal creatures in this book, from faeries to vampires and beyond, yet rather than being overwhelming, all of these elements worked together to create a truly fascinating world. I found myself caught up in the mystery and intrigue of both the paranormal world and the two boys right along with Katerina. I loved that she looked for the reason behind things - in line with her desire to be a doctor - instead of being a "normal" debutante and only looking for a husband. And for those of you who read "two boys" in the summary and immediately thought "love triangle," let me assure you, it's not what you would expect. There are, however, definitely romance scenes in here that will leave you smiling. There were only two things I wanted with this story - a better way to keep all of the nobility straight, because the amount of names was a bit overwhelming at first - and more. More of the brilliant writing, more of the world, more interaction between Katerina and George. After the ending of this book, I cannot wait to see how everything works out for Katerina. 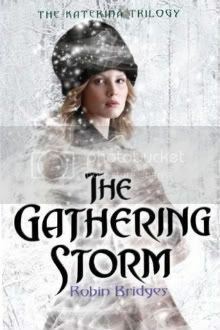 Blending elements of historical fiction and the paranormal, The Gathering Storm is a fresh new story that will capture you from the very first pages. I will be eagerly anticipating the next book in this trilogy! The sense of time travel I loved too. Glad we both enjoyed it though. This sounds like a very cool story. I haven't seen it around before, but I would love to read it.